Living a life where you are loved means having and using the capability to love. 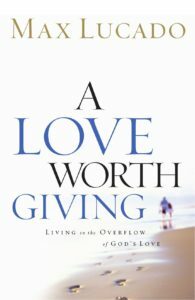 Max Lucado, bestselling Christian author, delves into an examination of love itself and how this complex yet grace-infused blessing system works. It all begins with the first chapter and his introduction of the 7:47 principle (from Luke 7:40-47 NLT). This principle addresses the passage where Jesus, invited to the prestigious home of Simon, finds the sudden, emotional appearance of a prostitute who bathes his feet with perfume and expresses true devotion more moving than Simon’s social acceptability which barely covered his lack of customary courtesies. When asked why Jesus tolerates the fallen woman so graciously, he notes that her tears and worship are real. She has sinned much but, equally, she has been forgiven much and she can, therefore, more fully understand the price of Jesus’ love. Specifically, if you are forgiven much you understand the wide-ranging, encompassing nature of unconditional love. Simon may not have sinned much, it’s true, and so he wasn’t forgiven nearly as much. Yet, despite the outward seeming goodness of this, he had less understanding of the scope of true love. I may speak in different languages[a] of people or even angels. But if I do not have love, I am only a noisy bell or a crashing cymbal. 2 I may have the gift of prophecy. I may understand all the secret things of God and have all knowledge, and I may have faith so great I can move mountains. But even with all these things, if I do not have love, then I am nothing. 3 I may give away everything I have, and I may even give my body as an offering to be burned. [b] But I gain nothing if I do not have love. 4 Love is patient and kind. Love is not jealous, it does not brag, and it is not proud. 5 Love is not rude, is not selfish, and does not get upset with others. Love does not count up wrongs that have been done. 6 Love takes no pleasure in evil but rejoices over the truth. 7 Love patiently accepts all things. It always trusts, always hopes, and always endures. 8 Love never ends (I Corinthians 13: 1-8 NCV). Within each chapter Lucado takes a quotient of love and examines how if you accept God’s love unto yourself then you project it outward to others. Being willing to be loved and having that openness provides a view into what love really is. For instance, love promotes hope, love eradicates pecking order, love is not self-focused, love resists anger, love is unfailing and determined not to give up. In each of these, and more, Lucado breaks down what this means for our everyday life. We may get the grand concept, but what would it look like if we embraced it and went even farther, to the granular level. What would our lives look like then? How would we act to family, to friends, to strangers? How would we react to a bad day at work or an exasperating spouse? Lucado himself gives examples from his own life: moments where he “got it” and moments when he invariably didn’t. What’s so charming about Lucado is his ability to be simultaneously simple and deep. A Love Worth Giving is straight-forward and simple enough for a beginner in the faith. Yet, when you look at it, it’s truly awe inspiring how Lucado strips everything bare and highlights Jesus’ meaning. Mostly, the book is tailored towards hitting the basics, but long time Christians will find themselves remarking over the plainness of a truth that while self-evident is often forgotten or unnecessarily complicated. 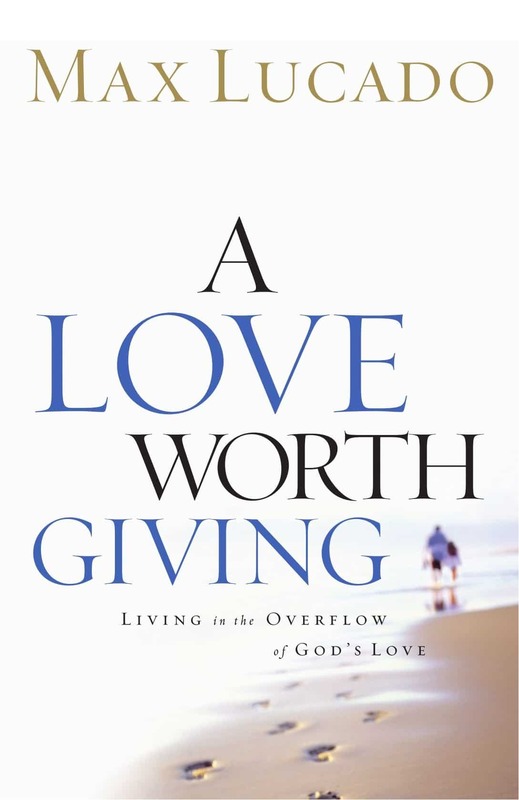 Joyous, memorable, and above all effecting, A Love Worth Giving is a self-help themed religious write-up with appealing frankness and poignant insight. Highly recommended.